The South Jersey National Society of the Children of the American Revolution is the oldest patriotic youth organization in the United States, and one of the few active South Jersey branches is named after Haddonfield’s founding mother Elizabeth Haddon. 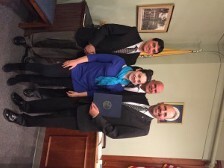 The society just celebrated its 85th anniversary last Sunday at the Indian King Tavern and received a proclamation from the borough last month for the occasion. “(The Elizabeth Haddon Society) is special because it has been around for so long. It’s cool that (Haddonfield) was around when the war was going on,” Elizabeth Haddon Society president and Moorestown eighth grader Carly Kramer said. “Right out here is where the British and patriots were walking up and down the streets; it is really cool,” senior president and Moorestown resident Jodie Kramer said. On Dec. 10, 1931, 8-year-old Virginia Luther of Haddonfield became the founding member of the Elizabeth Haddon Society of the National Society of the Children of the American Revolution. The Elizabeth Haddon Society is the only organization named after the founding mother of Haddonfield, Elizabeth Haddon. For the Children of the American Revolution, all members younger than 22 are direct descendants of a patriot who helped to achieve freedoms during the American Revolution. The organization provides a foundation for members to gain valuable leadership experience and conduct meetings with parliamentary procedures and standard protocol at local, state and national conferences. Jodie and Carly are descendants of Godfrey Shronk, who was a part of the Philadelphia militia who helped George Washington cross the Delaware River in 1776. He also is said to have provided City Tavern in Philadelphia with its catfish. “In our family’s folklore, we would say we would not be a free country without Godfrey,” Jodie said. The mission of the Elizabeth Haddon Society is timeless and, as children continue to join the organization, will continue to preserve American history. Carly and Jodie work together to create outings for members of the society to not only learn about history, but experience it. They have their meeting often at historical sites and events such as Washington Crossing, Betsy Ross House and City Tavern. “I like history more than I did. Now I know more about it because of the society,” Carly said. “I love that history comes to life,” Jodie said. Throughout the past 85 years, members of the Elizabeth Haddon Society have created awareness of local historic events including Run For Freedom, which celebrates Jonas Cattell, a teenage hero from the American Revolution; marking historic trees in Haddonfield to aid in conservation efforts; promoting literacy by donating more than 400 copies of “Happy Birthday, New Jersey!” to schools and libraries; honoring American History Month during the 1940s and 1950s; raising money to purchase war bonds during World War II; and providing volunteers for the Red Cross during the nation’s time of need. In honor of the 85th anniversary, the Elizabeth Haddon Society had a celebration at the Indian King Tavern on Sunday, Dec. 4 where it also revealed a chair it is donating to the Haddonfield Public Library for the celebration. 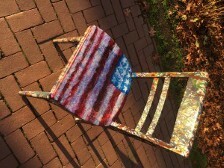 The chair, made by the National Art Honor Society, is created in honor and memory of Elizabeth Haddon. “It will be cool to have a memento of the society forever in the library,” Jodie said. There are just more than 20 members of the Elizabeth Haddon Society of the National Society of the Children of the American Revolution. Jodie said they are pretty active, but would love to have more members. Those interested in joining are asked to contact her at jodiekramer@comcast.net. “We are trying to revive the memberships. (The Elizabeth Haddon Society) is one of the stronger (societies), but it would be more fun with more kids participating,” Jodie said.